How Sundance winner Cindy Meehl, director of Buck, left fashion for films. Before she was an award-winning movie director, Cindy Meehl was a successful designer. 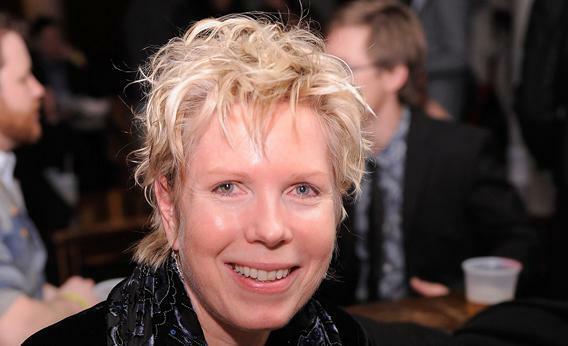 Director Cindy Meehl at a party for the Cinema Eye Honors for Nonfiction Filmmaking awards in 2012. When documentary filmmaker Cindy Meehl was 7, she fell in love with a pony at a birthday party. “I just wanted to get up close and touch the animal. I was in awe of it,” she says. Fifty-six-year-old Meehl smiles as she tells this anecdote, her tanned face brightening at the memory. As she talks, one of her four dogs snores audibly in the living room. Meehl and her husband live on a farm with a veritable menagerie—those dogs, a bunny, and two horses—in Redding, Conn.
She started riding at the age of 10 in her hometown of Jackson, Miss., and she still has a trace of a soft Southern accent. Meehl would ride as much as she could and sketch horses in her spare time—art was her other main interest growing up. But she never thought she’d combine the two, as she did with her first feature-length documentary film Buck, about horse trainer Buck Brannaman. Way before she became an award-winning movie director, Meehl was a successful fashion designer. She started her college education at Mississippi State and then moved to New York to finish her degree at Marymount Manhattan College, after which she studied art at the National Academy. When she graduated, she sold ties at Bloomingdale’s and wore a lot of shoulder pads. (It was the ‘80s.) She started designing dresses with two other artists using hand-painted silks. Her final designs were for a friend’s wedding party. She got married, and several years later she and her husband, writer Brian Meehl, moved to the horse farm in Connecticut where she lives today. Over the next several years, “I had children and an art studio,” Meehl says. And of course, she had the horses. Then, about 10 years ago, she took a clinic in Montana from Buck Brannaman, and it altered her entire outlook on riding. Brannaman’s way of dealing with horses is staggeringly sensitive. The way Meehl describes his methods while demonstrating with Red, one of her two horses, is that Brannaman teaches you how to speak their language. Instead of yanking on its reins to tell it what to do, you use your body to signal how you want the horse to move. Meehl seems totally relaxed when communicating with Red. She has that same easy repartee with Red when she’s riding him, showing how Brannaman’s body-language-based methods work on horseback. But she was also humble, and she had very little experience with a camera. So she went about hiring the best producers and editors she could find. She tried two filmmaking teams before she started working with producers Julie Goldman and Andrea Meditch. She flew down to Washington, D.C., to have lunch with them, “At that point I had some footage to show them. I was, of course, biting my nails to see if they’d actually help me,” Meehl says. They signed on, and they shaped Brannaman’s moving life story for the screen. In addition to being a so-called “horse whisperer” who can tame the wildest of stallions, Brannaman also survived a brutal childhood in rural Wyoming. His mother died when he was a child, and he ended up in a foster home. He went on to have a wonderful relationship with his wife and three daughters, and established a thriving business. Meehl also credits Buck’s editor, Toby Shimin, for helping her tell an inspiring story about Brannaman—so inspiring that the film won the audience award when it played the Sundance Film Festival in 2011. Meehl has also created 7 Clinics, an instructional DVD series using Brannaman’s methods; she directed a music video for the independent country artist Templeton Thompson for the song “When I Get That Pony Rode”; and she is currently helping to produce another documentary called Unbranded, about four young men riding horses from Mexico to Canada. But that’s not to say that Meehl is a one-trick documentary-making pony. She is interested in making films about non-equine topics and is in the early stages of planning a documentary about alternative veterinary medicine. Correction, June 6, 2013: This article misstated the number of characters in Cindy Meeh’s forthcoming documentary Unbranded, when Meehl decided to make a movie, and when she moved to Connecticut. This month, Slate is sharing stories of people who started over—like budget wonk Ina Garten, better known as the Barefoot Contessa—in our “Second Acts” Hive. We want to hear your tales, too. Please go here to submit your story about starting over.